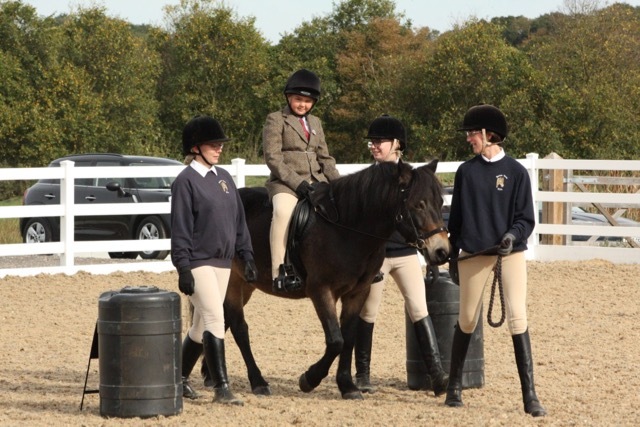 For 40 years we have been riding high at Barrow Farm enabling people with special needs and disabilities to develop their abilities and enrich their lives through riding. We have a range of events coming up, so please think about coming along to have some fun and support us. For more information about what is on, see our Events page. On the 11th May Barrow Farm RDA will be holding its annual Open Day between 10am and 4pm. Why don’t you join us to see what both our riders and the horses and ponies get up to. There will plenty of tea and cake too. Volunteer Coach and Trustee Isobel decided to challenge herself this year and raise money for us at the same time. Last year we asked if Isobel wanted to run the Big Half (a London based half-marathon) but she turned us down claiming ‘I run anyway, why would anyone want to sponsor for me for something I already do’. 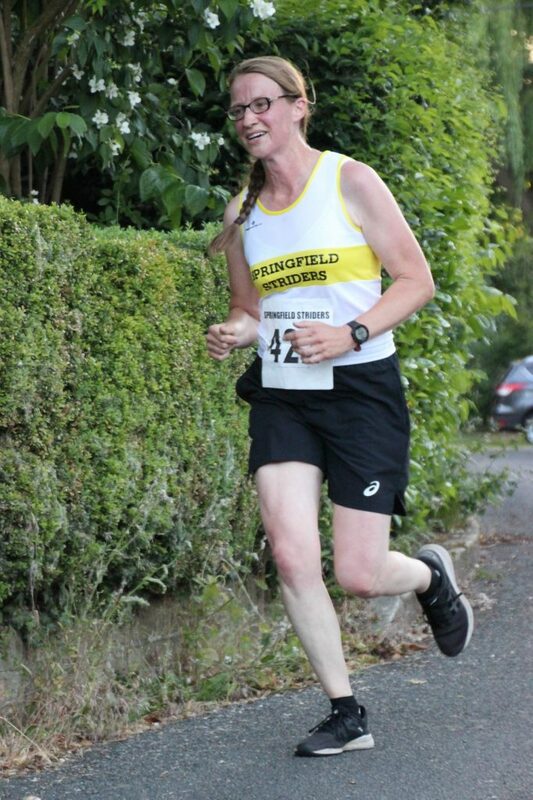 But Isobel had never run a marathon so this year she decided to run the Blackwater Marathon – follows the canal from Chelmsford to Maldon before heading a long the sea wall to Tollesbury. And two weeks later to cycle around the north coast of Scotland – a route called the North Coast 500. Most people drive this scenic route rather than cycle and there is 8153m (which is in excess of 26,000 feet) of climbing to complete on the route. Isobel completed the Blackwater Marathon on 31st March in a time of 4 hours and 26 minutes and was the first lady from a field of 20 female runners. She starts her cycle on 16 April. She is cycling between 33 miles on the shortest days to 62 miles on the longest days. This she says will be the biggest challenge – she hasn’t cycled further than 30 miles in a training ride and she doesn’t just have to do it on one day but 10 days in a row! 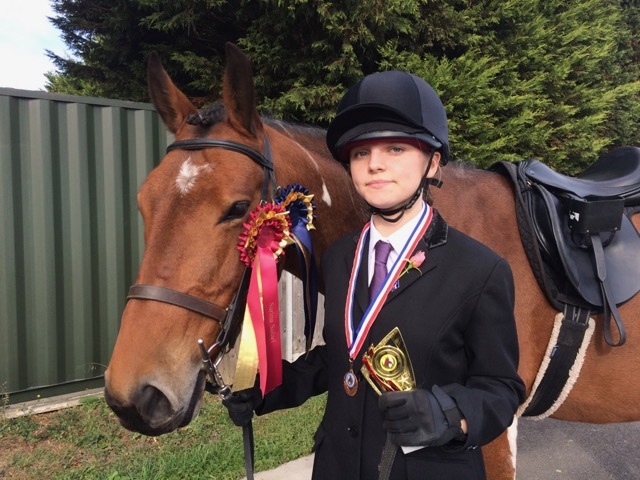 If you would like to sponsor Isobel you can go to her JustGiving page: https://www.justgiving.com/fundraising/isobel-gowers or leave a donation at Barrow Farm RDA. As many of you will know over the summer holidays we had some work done to replace the old dusty black rubber floor in the outdoor manage with a brand new specialist sand floor. These improvements to the floor will make it far easier for riders to make use of the space and when they do it will be nicer for both horses and helpers. 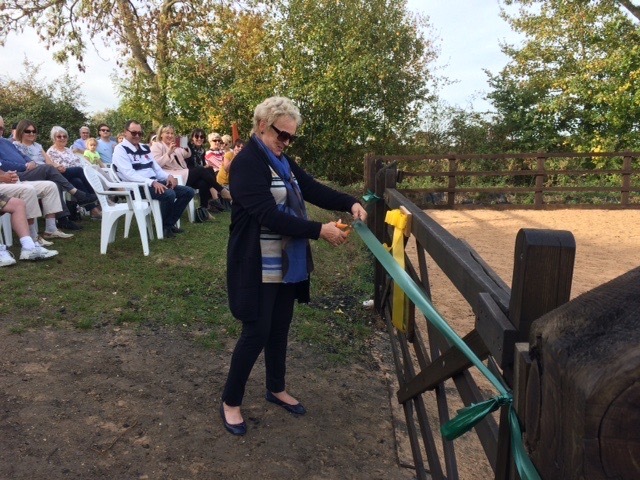 The trustees and staff at Barrow Farm RDA felt that the renewal and reopening of the outdoor arena would be the perfect opportunity to honour the late John Adler, who as a trustee played a vital role in the success of the charity. So on Saturday 13 October the John Adler Arena was officially opened. As well as the new surface our very talented trustee Jo had also repainted all the pictures and letters that go around the arena. The many groups and individuals who supported the project (that also purchased the equipment needed to maintain the arena) were invited to attend along with John’s family. Once the arena was open the 3.45 ride gave a demonstration of what it can be used for by completing a Countryside Challenge course of obstacles and then showing off their skills at trotting. A big thank you to the following organisations that supported the refurbishment and maintenance of the John Adler Arena including Essex Communities Initiatives Fund, M&G Investment Fund, Baily Thomas Charitable Trust, Chelmsford Round Table, Billericay Round Table, Stapleford Abbotts Golf Club, South Woodham Ferrers Rotary, Chelmsford Inner Wheel, Tim Platts, Rotary of Chelmer Bridge, Chelmsford Lions, Chelmsford Lionesses, Witham Lions and Romford Lions. 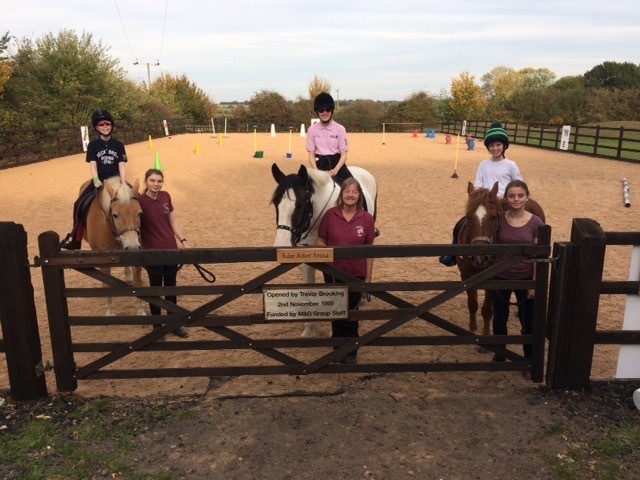 On Sunday 7th October we took Jaybee, Tango and Boycie along with six riders to a small, local competition put on by volunteers from Mid-Essex RDA group. We knew this show would have a relaxed atmosphere so we took this opportunity to take Jaybee and Tango to their first RDA competition. We also gave riders who haven’t had the opportunity to compete this year the chance to go so it was a new look team of horses and riders. Considering it was October and it rained a lot the day before we were very lucky with the weather. It was a bit cool but sunny! 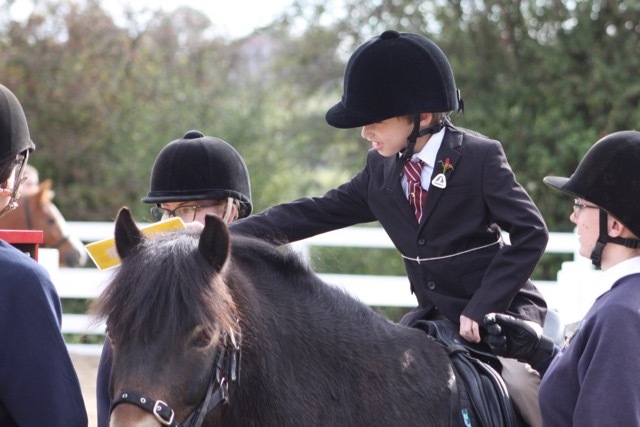 The ponies all behaved themselves impeccably and the riders did a fantastic job of looking stylish in the tack and turnout (Barrow Farm riders took place 1st to 5th – well done to all the staff for getting the ponies looking so good). 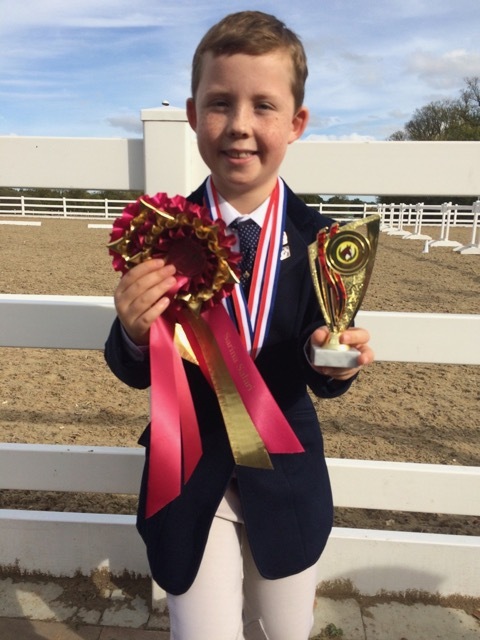 In the handy pony competition Christopher and Boycie won the junior section and Holly and Jaybee the senior section. 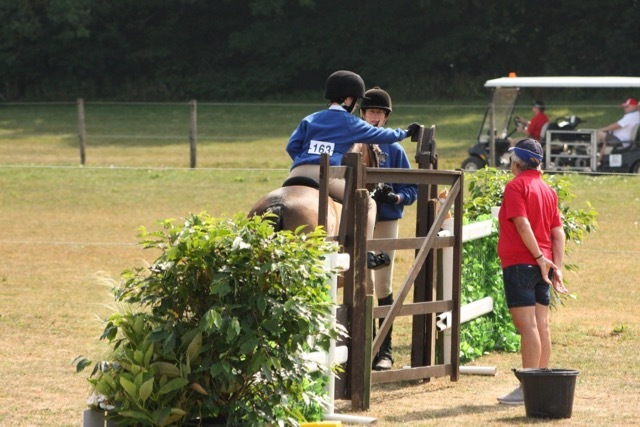 The handy pony course was very similar to the Countryside Challenge course at regional and national competitions with obstacles like posting a letter and putting an apple in a bucket. All the riders competed in handy pony and did an amazing job with lots of rosettes and this provided a great experience for Jaybee and Tango. In the afternoon came the dressage. We had just three riders in the walk and trot class. Jaybee was the star of the show and Emma won the junior class and Holly won the senior class. Tango also did a fantastic job and Isabelle came second in dressage, third in handy pony and third in tack and turnout. It just remains for me to say a big thank you to all the helpers who came to assist on the day especially Jack and Emily who did great jobs holding ponies and running back to the lorry for things. Thanks very much to Linda who let us use her lorry as the Barrow Farm RDA lorry had broken down and well done to all the staff and coaches for the work they do with the riders that enable them to have the chance to go out and compete. More photos of the Tango, Jaybee and Boycie will be on their pages soon. 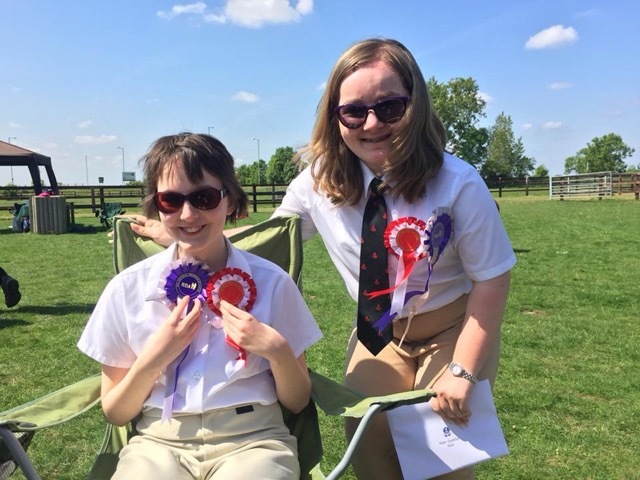 Following a very successful regional RDA qualifier we were all set to take six riders to the RDA National Championships in the middle of July. Unfortunately not everything went according to plan. First of all we had issues with the horsebox, which meant that we were unable to take our own and a big thank you to volunteer Pat and daughter Claire, along with their horse Murphy, who let us use ‘Murph’s box’. Secondly, in a reminder that horses can get injured as easily as us humans both Rafferty and Lula had soundness issues that meant a 9 hour round trip to Gloucestershire was not possible for them this year. Luckily Tawny the old pro was ready to step into the hole left by Lula, and Oural, in his first trip to the RDA National Championship would replace Rafferty in the Grade 1 dressage. First up was Charlotte in her dressage. It was a bit different riding Tawny at 12.2 hh compared to Rafferty who is 16.2 hh but Charlotte rose to the challenge. Tawny who is safe as a pony comes decided he would not give Charlotte any help though and tried to cut corners wherever possible and also stopped for a toilet break! Charlotte was fantastic, whatever Tawny throw at her she made the corrections and demonstrated great resilience! Well done Charlotte not only did she show some expert riding she beat her score from last year too! 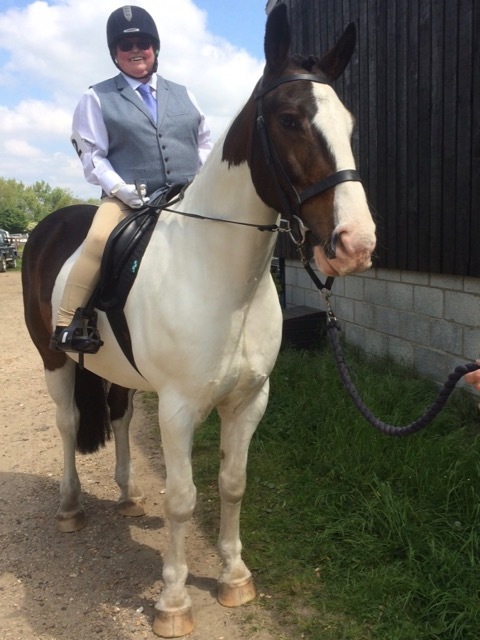 Charlotte who is blind needs eight callers for dressage and four tappers for Countryside Challenge (more on that later). Her callers and tappers mean that Charlotte knows where she is within the arena and knows where the obstacles are in the Countryside Challenge. Next up was Andrew in the Countryside Challenge. For those of you who are not familiar with Countryside Challenge the riders have to complete a course of obstacles they might meet if they went for a walk in the country. They have to post a letter, steer around obstacles, walk under low branches, stop at the road to check for traffic, walk over a bridge and open a gate. Andrew did a very good job throughout the course but you have to be absolutely perfect to do well at the National Championships and Andrew came a very respectable 7th in a big class. It was then time for tack and turn out. Clare did an amazing job plaiting Owly’s mane and tail and making sure that there was not a spec of dirt on him, the rest of the helper team ensured his tack was gleaming. But tack and turnout is not just about the pony, the riders have to be spotless too and wear show jackets rather than sweatshirts for this competition. Andrew did a fantastic job of looking smart, such a good job in fact he was 2nd in the junior class with Charlotte coming 10th. Then it was time for more work for Tawny (he is a very hard working pony). This time it was Charlotte in the Countryside Challenge. Charlotte’s team of tappers use wooden sticks to tap the objects to help her locate them. This means Clare has to use very few verbal commands to help Charlotte meaning that she can demonstrate a high level of independence. 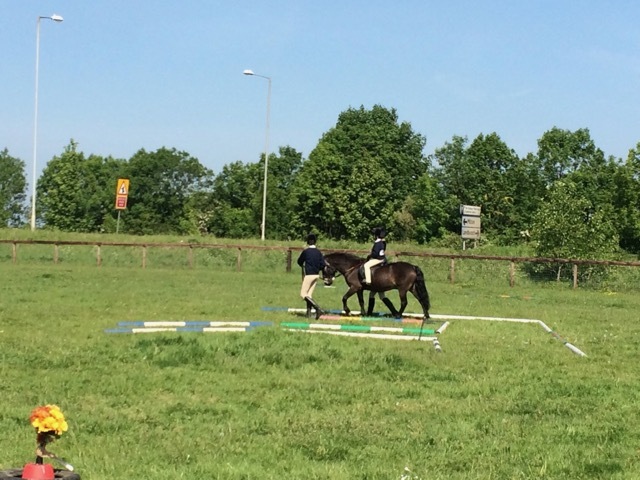 Charlotte had wanted to do the Countryside Challenge off lead, which she did on Lula at the regional championships. Unfortunately the pull of grass and other green plants on the country side challenge would be too much for a greedy pony like Tawny. Needless to say Charlotte did a incredible job on a long lead rein, especially as Tawny had another toilet stop mid course. Her demonstration of independence was obvious to the judges and she didn’t only win the junior section, she was class champion with the highest score across both junior and senior sections. Well done Charlotte! 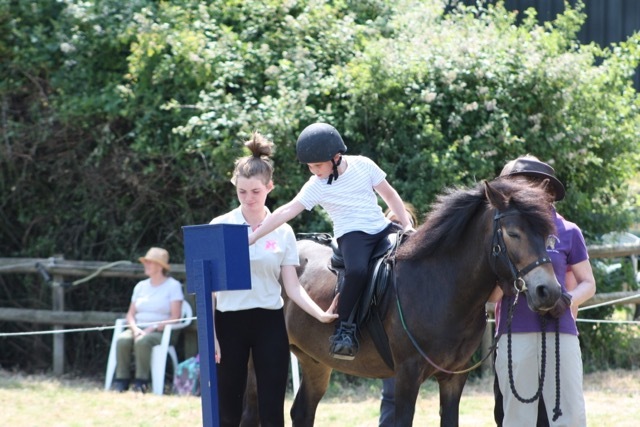 Sunday 1st July saw our annual Horse Show take place. Our riders could take part in dressage and/or countryside challenge classes and for the second year running the weather was very kind to us. The morning was dedicated to dressage. First up were the off-lead dressage tests, which were kindly judged by Linda Nelson. This class was won by Holly riding Dusty. This was Dusty’s first attempt at RDA dressage and he was a very good boy. One of the great things about holding this competition at home is that all of our riders have the opportunity to compete. 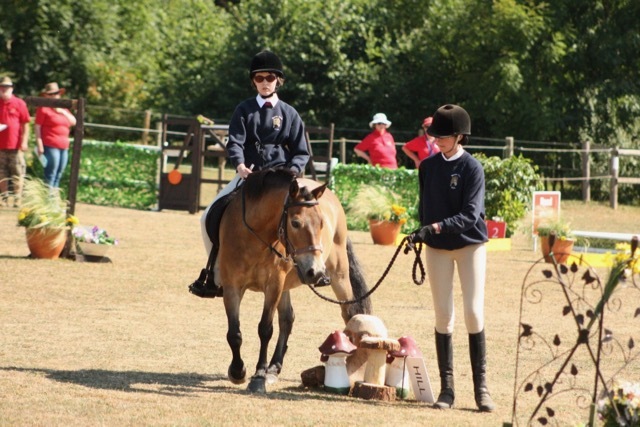 When we go out to competition we are unable to take all the ponies and horses as they have to undergo additional training to ensure that they will be safe in an unfamiliar environment with all the added complications of competition too. For our new horses this show at home introduces them to bigger audiences, a greater range of sights and sounds whilst still in a familiar environment so is a key part of their training. The next class up was the freestyle, which could be completed with or without music. Here the riders choose what dressage movements to include and both the music and the movements should suit the horse. The winner of the freestyle was Claire riding Oural. This was Oural’s first off-lead RDA dressage competition and he had been drafted in at the last minute as Rafferty had gone lame. This was only the second time that Claire had ridden Oural (the previous time was a hack) and was an important competition as it was the dress rehearsal for the National Championships two weeks later. The final dressage class of the day was the led class that was kindly judged by Gwen Egginton. This class was won by Evie riding Jaybee. Evie has not been riding long so this was a real success. 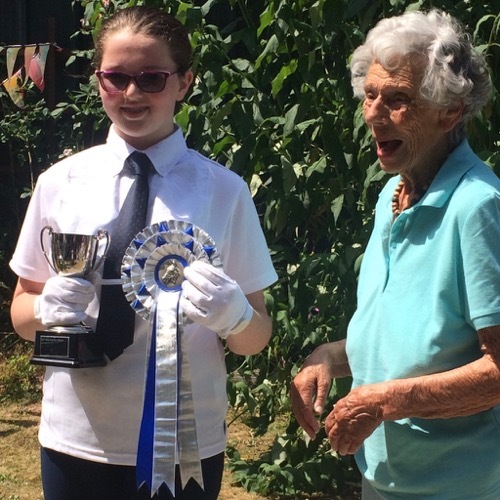 She also had the highest overall dressage score and therefore won the ‘Jet the Blue Peter Pony’ trophy for the highest score across all dressage classes. The trophy was presented by Mrs Mary Mitchell. Well done Evie. Following the dressage, the afternoon was spent doing the Countryside Challenge. Again there were three classes, one for riders with sidewalkers, a led class and an independent class. The first obstacle on the Countryside Challenge course is to post a letter in the post box. It was a warm day and all the spectators tried to stay in the shade of the hedge. 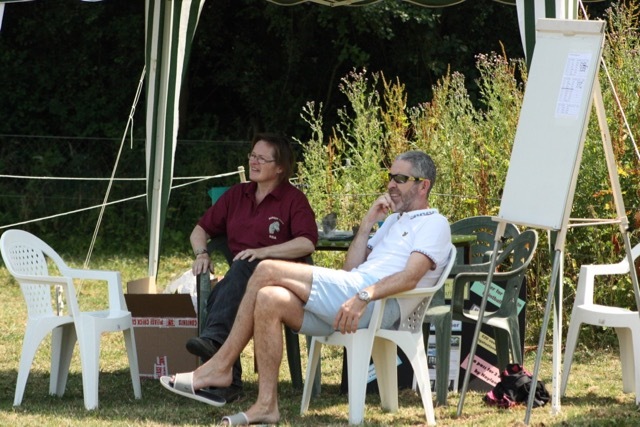 Here you can see our Chairman James and Scorer Gill, watching the activity in the Countryside Challenge ring. The winner of the class for riders with a side walker was Isabella who has only been riding since May last year. The winner of the led class was Andrew, which follows up his second place at the regional championship in May. The final class of the day was the Independent Class. This was a very fiercely contended class that produced some of the highest scores of the day but more on that later. For William who has ridden with us for about 30 years it was a lovely celebration of his time riding at Barrow Farm as it was his last ride with us before moving to Oxfordshire. In the end the class was won narrowly following an excellent round by Isabelle on Tango. We award a very special trophy to the rider with the highest score over all the Countryside Challenge classes. The John Adler Trophy celebrates all the hard work that John did for the group in over 30 years as a Trustee. The winner this year was Isabelle on Tango. 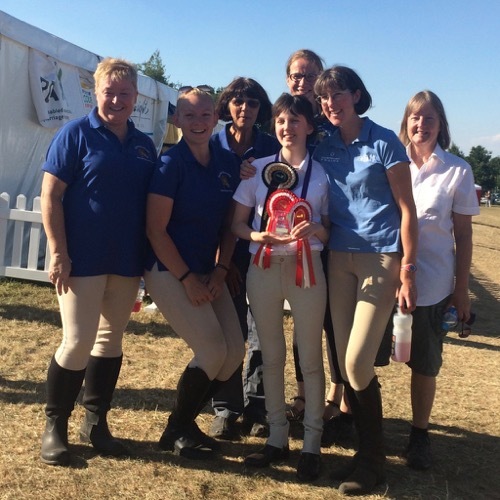 The trophy and rosette were presented to Isabelle by last year’s winner Charlotte. Well done Isabelle! Thank you to all those who sponsored the classes including Kampa, Thermotel, Spring GM, Murphy and the Peck Family. Finally we have to say a big thank you to all the volunteers who made this day possible. We needed lots of help stewarding as well as all the helpers working with the horses and ponies. Thanks also to all those who made scones and cakes for the strawberry tea, we raised £300. 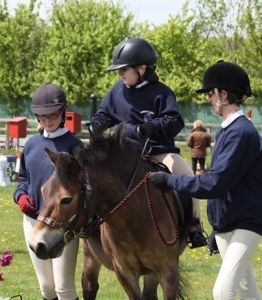 Well done to the whole team who went to the RDA regional competition on the 20th May. The riders, parents, carers, volunteers, ponies and staff all did a fantastic job. Six riders competed in the Countryside Challenge, with Isabella and Harvey coming 4th and 6th in the class for riders with a sidewalker. Team Barrow Farm RDA did a fantastic job in the led class with Emanuele winning, Andrew 2nd (both qualifying for the National Championships) and Darcey a very close 3rd. It was the first time all these riders had attended so a big well done for rising to the occasion. In the vision impaired class, Charlotte, who is blind, scored an incredible 88%. Charlotte has competed before. She has been used as an example to promote more blind riders to take part in the event but she is always up for a challenge. So this year Charlotte completed the Countryside Challenge off-lead on Lula with Clare only there to provide audio information where necessary. Charlotte has a team of tappers who tap the obstacles so she knows where they are. Charlotte also qualified for the National Championships. 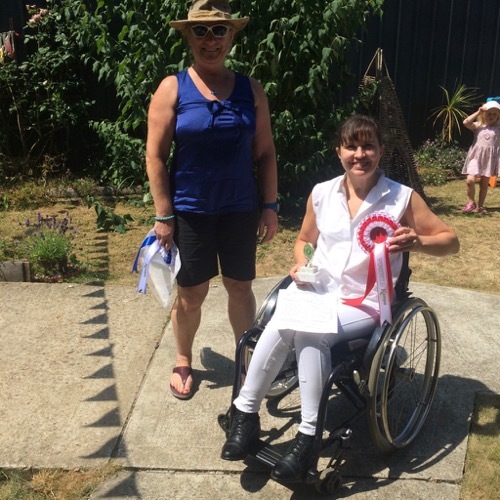 In the dressage, Charlotte also qualified for the National Championships, her challenge in the dressage was to do it on a different horse. Last year she took the dependable Tawny, this year she went much bigger and rode Rafferty. She did a great job and Rafferty behaved impeccably apart from being keen to investigate the judge’s lunches which contained apples. 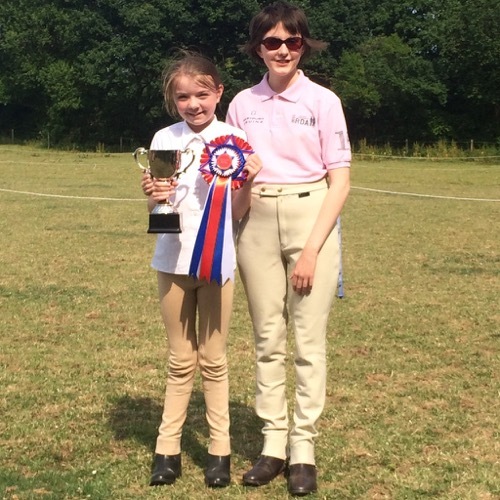 Rebecca who rides alongside Charlotte on their regular lessons also competed in the new Introduction to Dressage qualifying class, she won her class and also qualified for the Nationals. Rebecca rode the very dependable Lula. On the senior team Claire rode Rafferty to win the Grade 1 dressage, with Emma on Lula coming a very close 3rd. 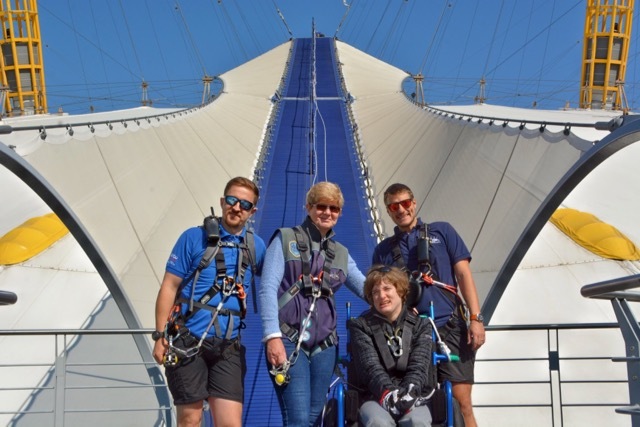 Emma has had a busy week as she raised funds for Barrow Farm RDA earlier this week by going over the O2. Clare, her coach, said that she was really pleased with how Emma and Lula performed their test, they have been working on their accuracy and this paid off on the day. 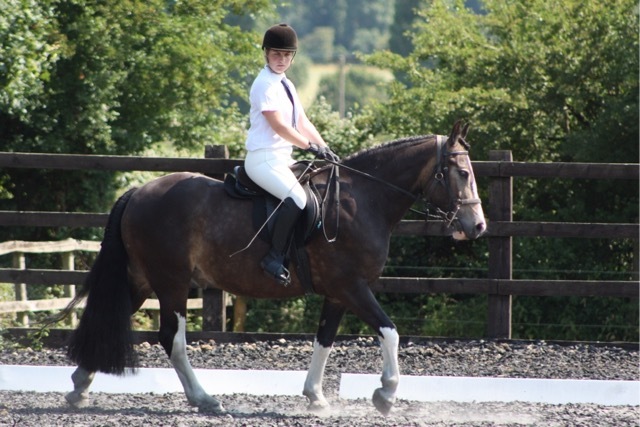 Another first timer was Gina who also rode Rafferty in the Grades 1-6 walk only dressage. 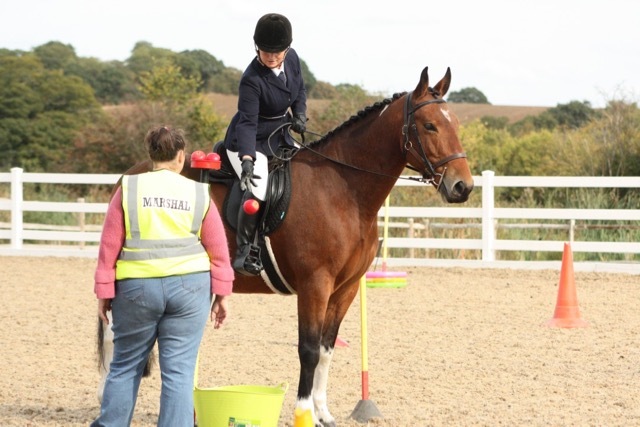 She scored just under 68%, the highest Barrow Farm RDA score of the day and was another one to qualify for the National Championships. Well done team, and we look forward to our next competition which is at home on 1st July, with the National Championships occurring 2 weeks later. Well done to all our riders and the horses and ponies who all did an amazing job showing off their skills at our Open Day on Saturday. 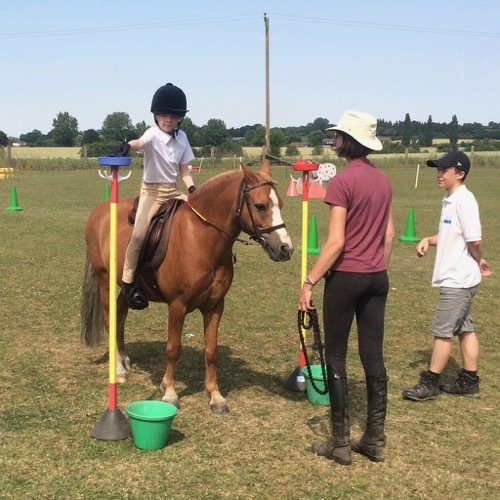 Our regular Saturday riders demonstrated a wide variety of activities that we undertake at Barrow Farm RDA; including a walk in the wood, musical rides, countryside challenge, steering and a variety of other props. We were also treated to a few surprise displays. 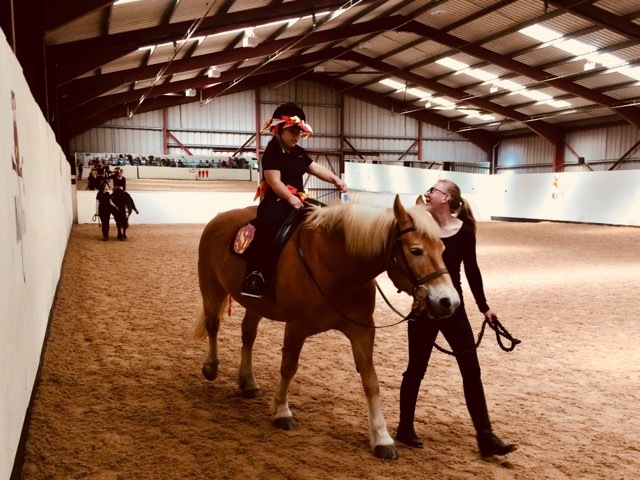 We had Emma and Sophie performing their fire themed musical ride (you can see Sophie warming up with Nicco above). 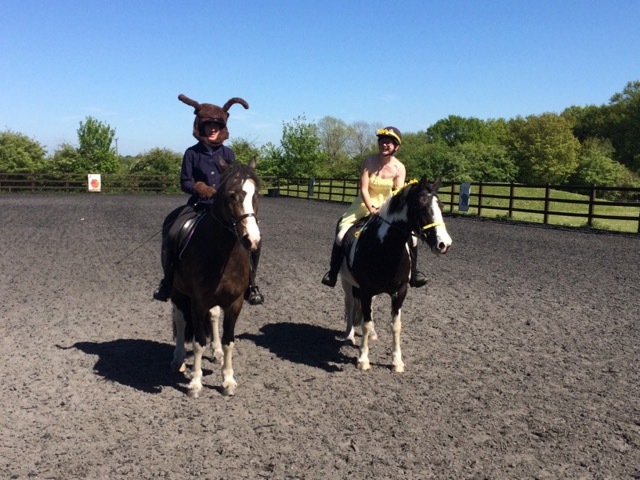 Clare and Liv did a Beauty and the Beast themed ride on new horses Dusty and Vella on their Open Day debuts. Both of them behaved brilliantly all day and were not fazed by the audience. 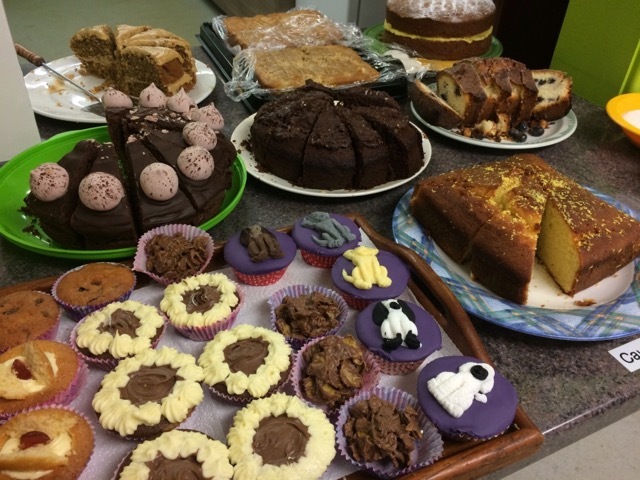 A big thank you to everybody who made cakes. It keeps the spectators happy and is a great way of raising funds too. The weather was lovely and lots of people stayed to watch several of the rides and enjoyed a piece of cake with a cup of tea in between. Thanks to everyone who came to visit and we hope to see you all again soon. 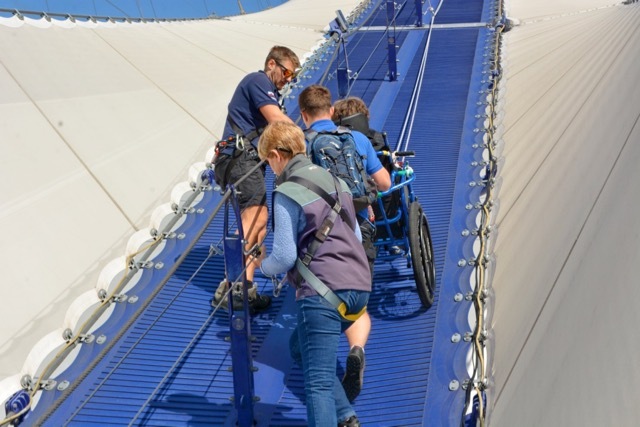 For those scared of heights the thought of walking over the O2 arena may be daunting but it is a different challenge if you are unable to walk unaided. But this is what one of our riders, Emma, will be doing on 15th May to raise funds for Barrow Farm Riding for the Disabled. 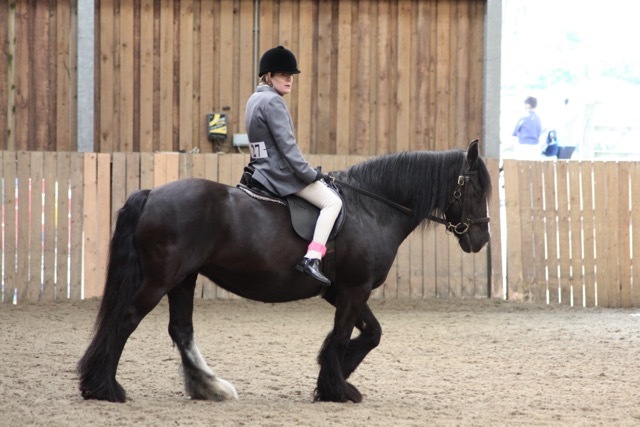 Emma, who has been riding with us for over 20 years, states that the reason she is raising funds for us is because ‘(Barrow Farm RDA) helped me reach my dream of competing in off-lead dressage’. 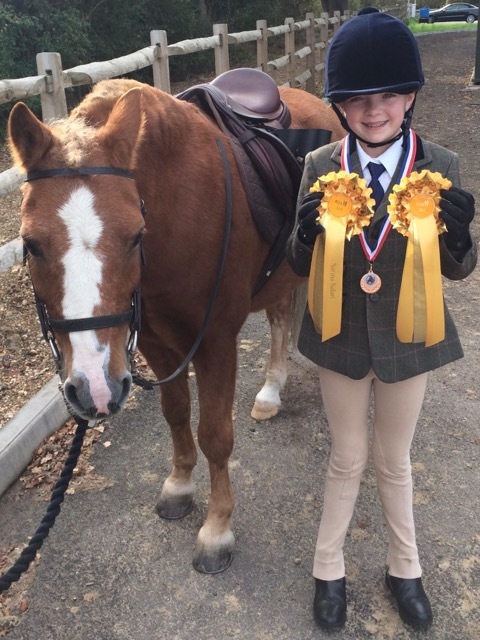 Emma’s goal is to help other riders with disabilities reach their dreams. To support her please donate via JustGiving by following this link.